If you’re a Speed Scrabble player and running Firefox, then you might be interested in trying the new Speed Scrabble Extension. The add-on helps you keep track of who is currently online so you can easily drop in for a game. Try it out!. 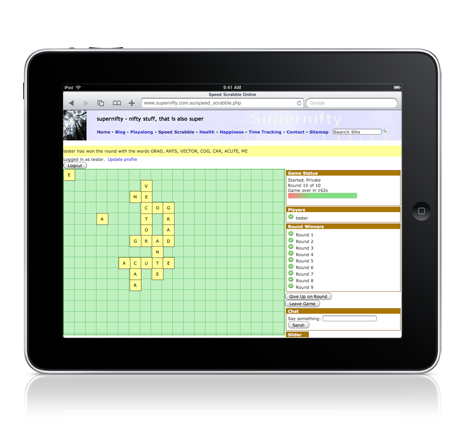 Speed Scrabble is a fast, fun and free online multiplayer word game. If you’ve not played it before then check it out! If you aren’t a Firefoxer, there are similar extensions for Safari and Chrome. If you’re a software developer interested in seeing how the extension works, the source code is freely available and can be used for any purpose. If you have any thoughts on the new extension, feel free to get in touch! QI is easily the number 1 word, with AI and IN second and third. I guess most people know that trick when you get stuck with a Q without a U. 2-letter words dominate the list, taking the top 11 spots, and 66% of the top 80. 3-letter words round out the list, with the first 4-letter word, RAIN, coming in at 112th. It’s a little surprising, but understandable given that Speed Scrabble focusses on speed. qi: The fundamental life-force or energy. aa: Lava having a rough surface. er: Used to express hesitation or uncertainty. id: In Freudian theory, the division of the psyche that is totally unconscious. oi: Said to get someone’s attention. lo: Used to attract attention or to show surprise. re: Music – The second tone of the diatonic scale in solfeggio. la: Music – The sixth tone of the diatonic scale in solfeggio. ti: Music – The seventh tone in the diatonic scale in solfeggio. li: A traditional Chinese measure of distance, today standardized at 500 meters (547 yards). 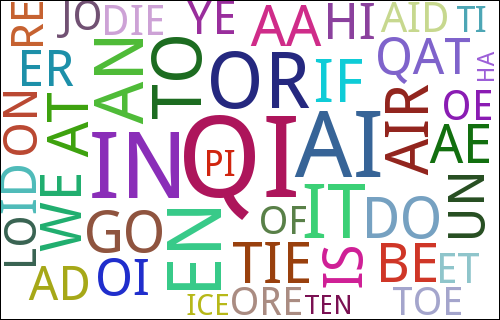 pi: The 16th letter of the Greek alphabet. yo: Slang – Used as a greeting or to attract someone’s attention. joe: Informal – Brewed coffee. yen: A strong desire or inclination; a yearning or craving. fa: Music – The fourth tone of the diatonic scale in solfeggio. So now you know: yes, they really are words. If you’ve not played Speed Scrabble, try it out. It’s fun, fast and challenging. And occasionally educational. Exciting news! Speed Scrabble is now compatible with the iPad. Yeeha! To play Speed Scrabble on the iPad, just drag the letters around with your fingers to form words. Too easy! Your iPad might just give you the competitive advantage over your mouse-based opponents… or simply a more enjoyable way to brush up on your word skills. If you have an iPad, please try out the updated Speed Scrabble game. As always, feedback is welcome… we are aware that the background grid can get a little messed up during play on the iPad, this shouldn’t interfere with the game play. We hope to tweak the iPad experience in future releases – and potentially release an iPad app. Now, go try it out! Supernifty a le plaisir d’annoncer que Speed Scrabble est maintenant accessible en français. Si votre langue maternelle est le français, ou si vous voulez travailler vos réflexes en français, alors essayez French Speed Scrabble! Feedback on the French incarnation is welcomed. Supernifty’s servers have recently been upgraded. Our old server was barely coping with the load, particularly that generated by Speed Scrabble, so Supernifty is now on a faster, more powerful server. This means a zippy, more reliable experience for everyone. If you do encounter problems, please get in touch. You may have encountered a few timeouts during the migration, but now everything appears to be great. Some interesting game options have been added to Speed Scrabble. An often requested feature has been for all players to receive the same letters, thus allowing a competition of pure skill. Well, it’s here. Find out for sure who is the best Speed Scrabble player! If you don’t feel like playing against anyone else, be it so you can pursue that ridiculously long word, or are just learning the game, select the Private option, and nobody else can join your game. No more stressing about some guru coming in and ending your game. Feel like a challenge? This option disallows 2-letter words, which makes for a surprisingly difficult game requiring planning and forethought. If you’re tired of ultra fast Speed Scrabble, this will slow you down, and as a reward, winning with this option scores you many more points. Further details about the new game options are at Speed Scrabble Help. To access the new options, you will probably need to hit “Reload” on your browser, while on the Speed Scrabble page. We’re hoping these will make for some interesting variations on the game. Feedback, problems or ideas regarding these new options (or anything else) are welcomed – do not hesitate to contact us with your thoughts. Why not try out the new game options right now? You are currently browsing the archives for the speed scrabble category.